I'm doing flag workshops everywhere. I'm teaching people how to make flags by hand painting them with large brushes and how to fix "my mark" upon them using color dyes. This is not the original way flags were dyed. After the the flags are made, we have a parade around the town with the flags hoisted in the air. Kids are very proud to parade around because it attracts great attention. They feel the vibration of the wind on the flapping flag through the flagstaff. They catch the shape of their body being blown by the wind when close their eyes. Then we can really feel we are alive with trees and birds. This wind blows in America, Africa and even Antarctica. Then the wind returns to the place where we are. 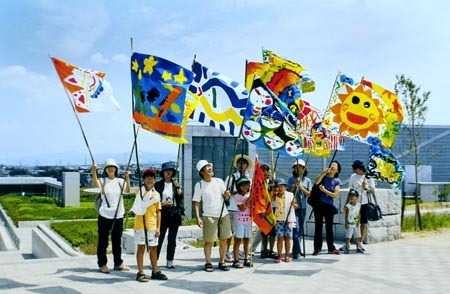 I'm holding workshops with the wish that the kids will do something as one life on Earth together when they grow up, on basis of the feelings they experienced with the flapping flags. The picture above is from the workshop held at Sayama Citizen Hall. The parade finished at the Sayamaike Dam museum. It was a day full of smiles with the flags flapping under the clear sky.